It is weird to visit a place that you have seen before. The Basilica Cistern was used as a location for the 1963 James Bond film From Russia with Love. As we descended the stairs, there were naves of romantically lit columns, hence a basilica. In fact, our word for a major church comes from the Ancient Roman architectural form; however, they used it for many different secular purposes from stock exchanges to legal courts. 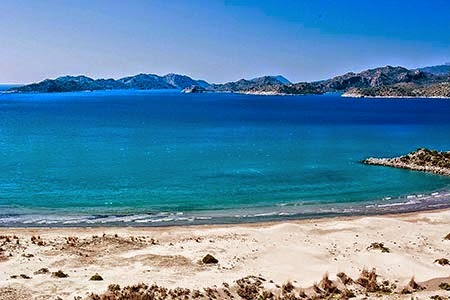 The maps and signs in Turkish will call it Yerebatan Sarayı or “Sunken Palace”. 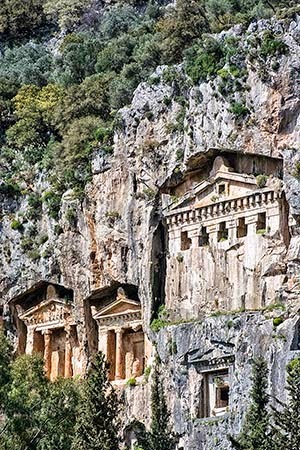 It was never a palace but it was the site of a Roman basilica used for commercial and legal purposes. 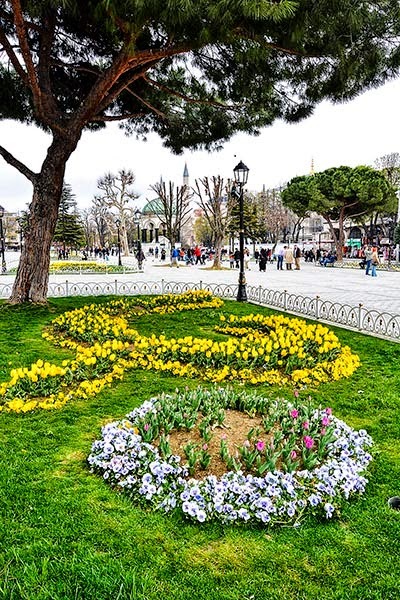 The cistern is located 290 m east of the Sultanahmet tram stop and just on the other side of Divan Yolu Caddesi (the tram street) from Hagia Sophia. 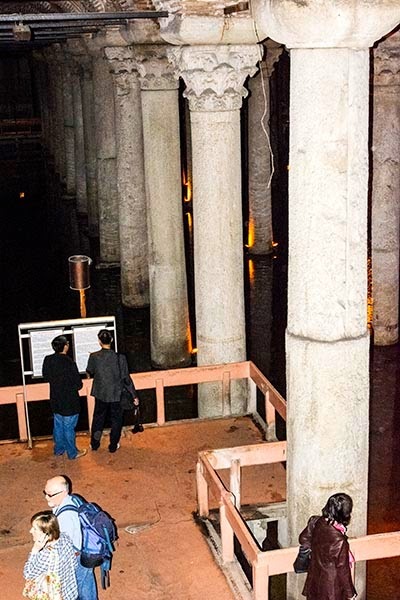 Unfortunately, the Basilica Cistern (open 09:00 to 18:30 hrs, TRY 10) is not included in the Istanbul Museum Card, which is not recommended. The Milliarium Aureum (Golden Milestone) in the Roman Forum marked the centre point for the Roman Empire. It is from here that all distances were measured and it was the basis for the expression “all roads lead to Rome”. 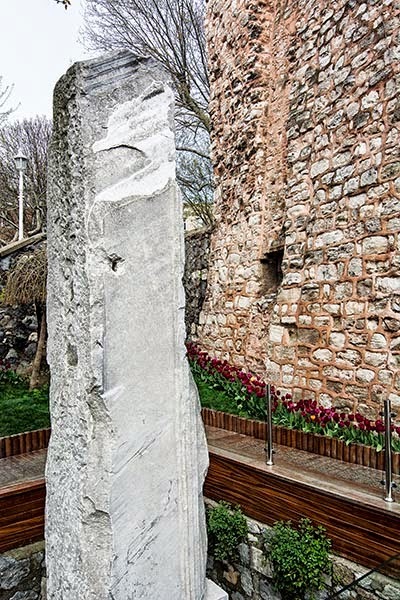 In a pit on the north side of Divan Yolu is a non-descript, single stele. Most tourists just pass it by. It does not look very impressive. Like the name of the city (Nova Roma), Constantine based the Milion on the Golden Milestone in Rome. It marked the centre point for the new Roman Empire (it was only called Byzantine Empire in the 16th century). But all roads really did lead to Nova Roma, i.e. Constantinople, because it was the financial capital of the Roman Empire; it was the terminus of the Silk Routes, both by land and by sea. Now imagine that the Milion was a double triumphal arch surmounted by a dome. You have to visit Afrodisias to see what a tetrapylon (four arches) looks like. 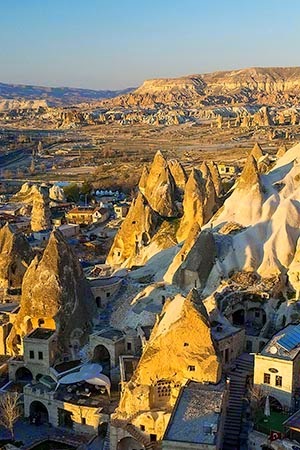 Now image the arches on the right in Istanbul supporting a dome and that it had survived until the 15th century. The Basilica Cistern is a Byzantine underground water reservoir built in the 6th century during the reign of Byzantine Emperor Justinian I. 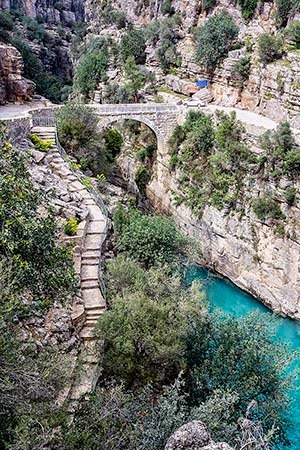 Several kilometres north of here you can still see a small portion of the Valens Aqueduct that carried water to here. 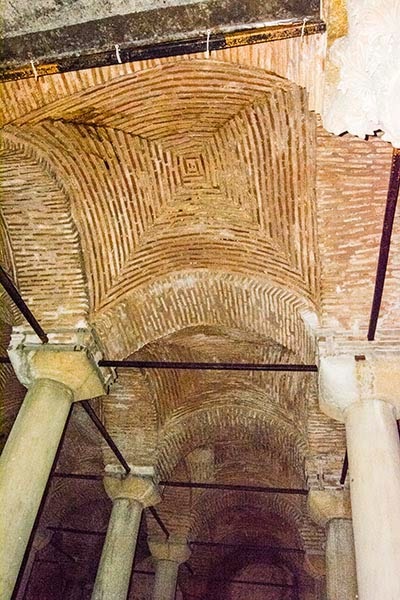 The cistern provided water for the Great Palace of Constantinople and other buildings on the First Hill (of the Seven Hills of Constantinople). It provided water to the Topkapi Palace after the Ottoman conquest in 1453. After descending the stairs there is a small shop. 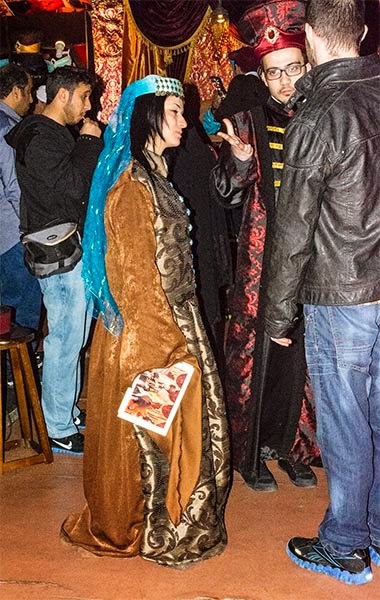 One concession provides colourful Ottoman costumes you can put and have your picture taken. The dimly lit cavern is a cathedral of 336 columns, arranged in 12 rows of 28 evenly spaced marble columns. 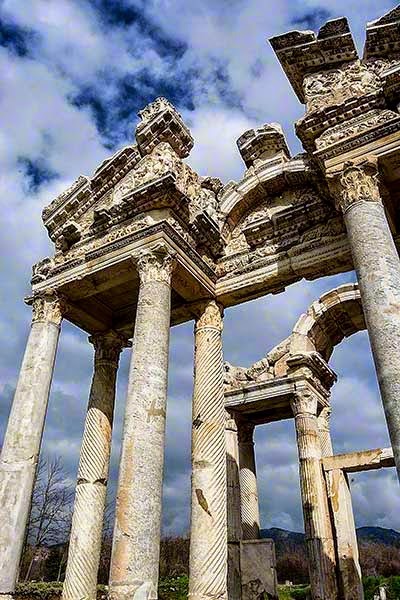 The capitals of the columns towering above you have diverse styles, which suggest that these columns came from other buildings. 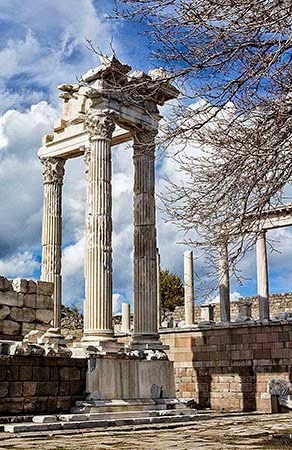 The Greek Ionic style actually originated in Turkey. What? 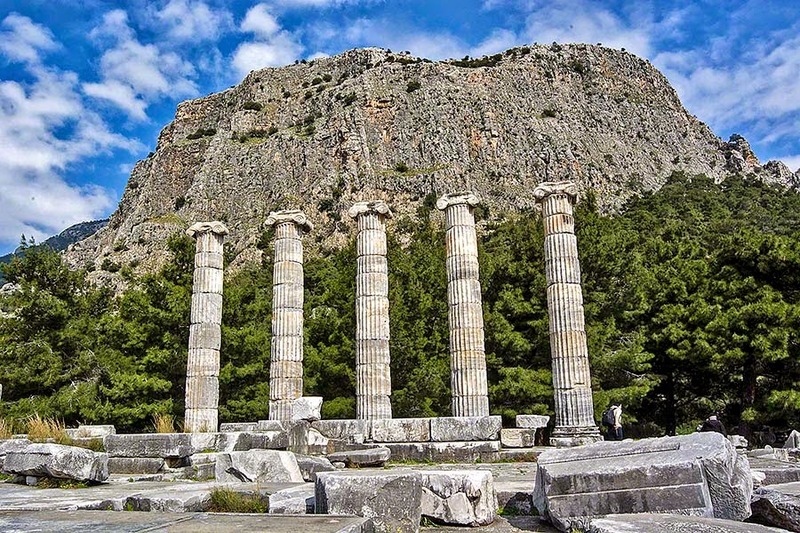 As discussed in How is Priene connected to Architecture?, the Greek League of Ionia was located on the Turquoise Coast between Priene and Didyma. ﻿﻿﻿﻿There are very few paths through the cistern maze but make sure you visit the furthest northwest point from the entry stairs. 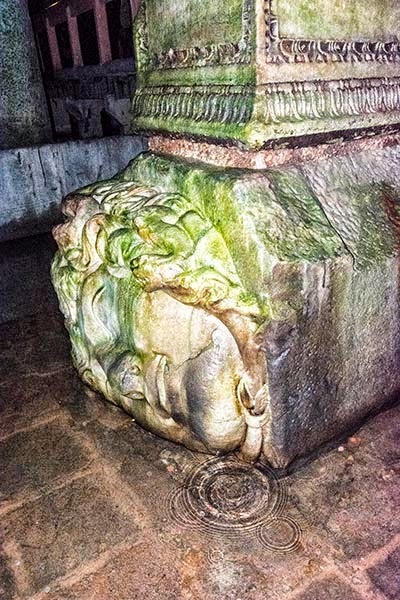 The bases of two columns reuse blocks that already had images of Medusa. She thought she was the most beautiful woman in the world and was constantly looking at her reflection. Unfortunately, on her visit to the Parthenon, Medusa said she was more beautiful than the statue of Athena, the goddess of beauty and wisdom. Athena suddenly appeared and turned Medusa's hair into a nest of snakes, made her face ugly, and empowered her eyes to turn anyone who looked at her to stone. For the same reason, Medusa could no longer look on her face in a mirror! A famous statue by Cellini in Florence depicts Perseus after he cut off Medusa's head with his sword. 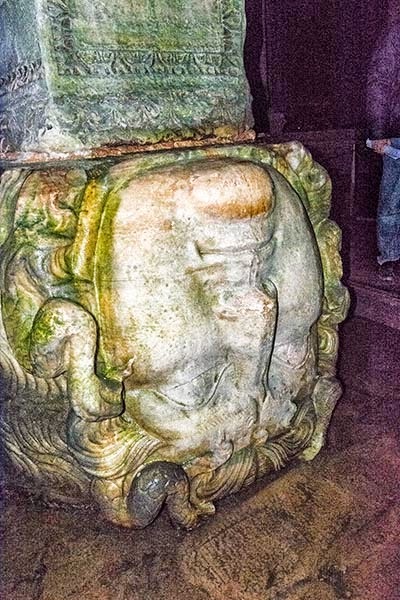 ﻿﻿It is hard to believe that Medusa's gaze could turn you into stone but the Ancients were a very superstitious lot. Our expression “getting up the wrong side of the bed” originates in Ancient Rome when it was considered bad luck to get up on the left side of the bed! The Latin word for left is sinistra, the origin of our word sinister! It is no wonder that left-handed people were deemed evil. So they placed the Medusa images sideways or upside down thinking that this would neutralize the power of the Gorgon's gaze. Didn't they realize that this would not affect the magic of Medusa? The symbolism of Medusa was used throughout society. 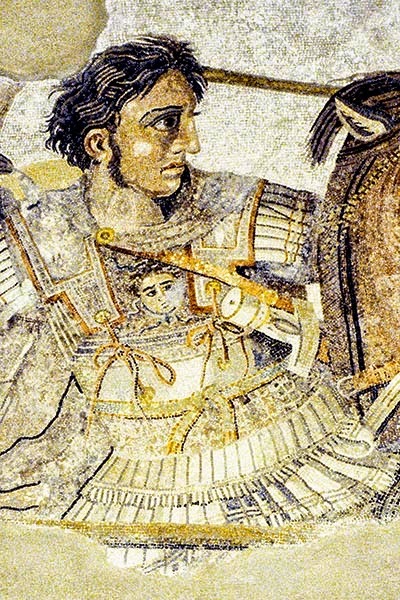 In this photo taken in Napoli (Naples), we see Alexander the Great wearing an image of Medusa on his breast armour. ﻿Well from gloom we went to bloom. The Basilica Cistern did not take long so we went around the Sultanahmet Park and the Hippodrome (coming to a post near you) to take photos in the sunshine. It finally turned warmer today. The tulips were in full bloom. The word tulip is derived from the Persian word ‘tulipan’ which means turban. Sultan Suleiman the Magnificent introduced the Central Asian tulip to Europeans. It is a symbol of life and fertility and is a popular motif on pottery and tiles. 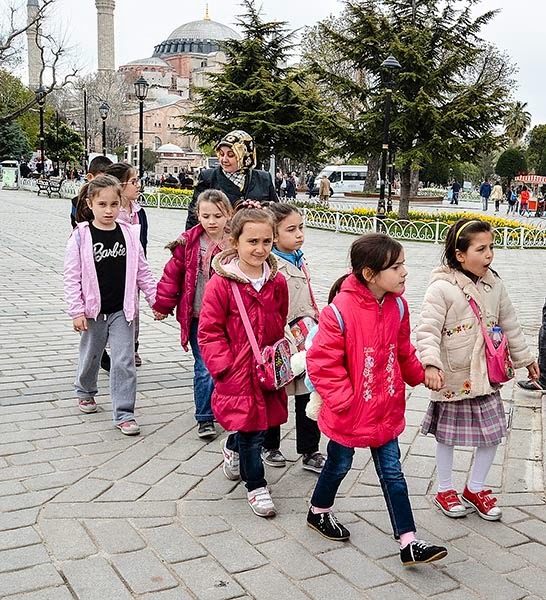 Sultanahmet Park is a great place for people watching - there is a mixture of locals and tourists. It is also a great place for views of historic Hagia Sophia. This is the third church on this site. 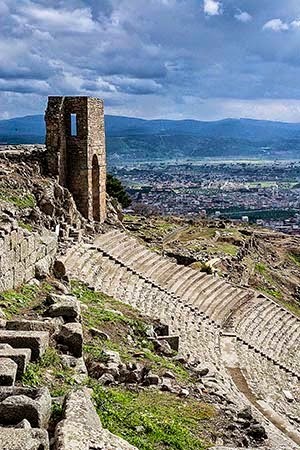 While there have been many earthquakes that have damaged the building, the first two churches were destroyed by rebellions during the Byzantine era, which will be discussed in the Hippodrome post. 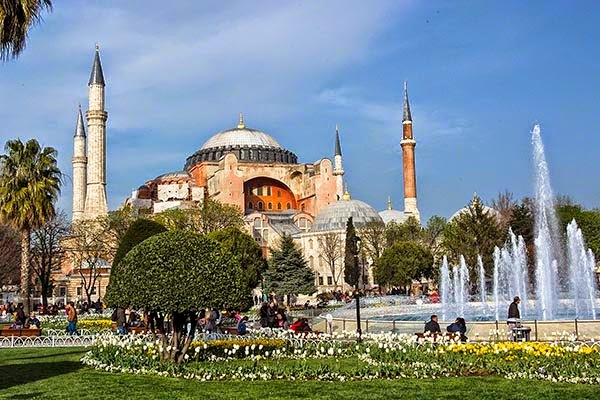 ﻿The current Hagia Sophia was the world's largest cathedral with the largest dome built since the Pantheon in Rome and until the dome erected by Brunelleschi at the beginning of the Renaissance to complete the Duomo in Florence, Italy. 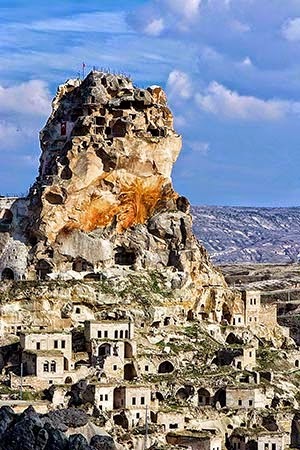 After 1453 the Ottomans quickly transformed the city from a bastion of Christianity to a symbol of Islamic culture. So the Church of Hagia Sophia was converted into a mosque complete with minarets. 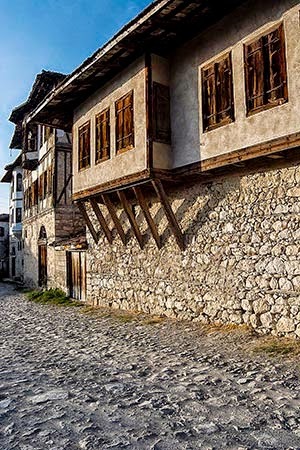 However, the Greek influence in Turkish history is palpable. Constantinople was originally simply called Istimbolin by the Greek residents meaning “(in) The City”, which was in turn was derived from the Greek word polis (city). Today the name has changed back to Istimbolin, now spelled Istanbul. Last Post: Grand Bazaar – Gigantic!